If you’ve never heard about The Kelpies, then you’re probably not from Scotland. We’ve been hearing about them forever. Seriously. When an extension was built to the Forth and Clyde Canals in Central Scotland, it was decided that a sculpture would be put in place as part of a new park that would connect communities within an area called Falkirk. Helix is the name of that park and has been open to the public since April 2014. 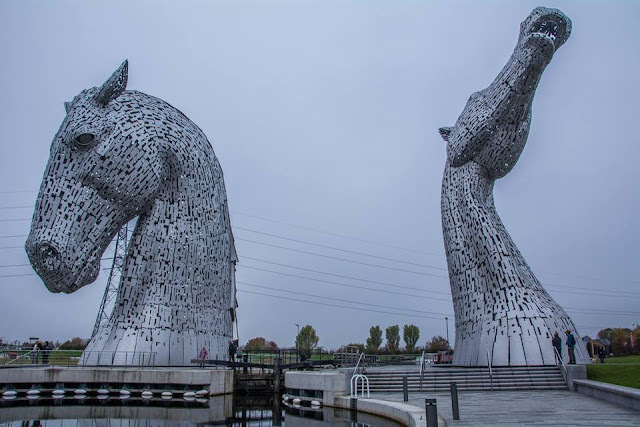 In October 2015, the shiny new visitor centre opened and it helps to finish off the attraction and provide some background to the Kelpies structures, as well as a lovely gift shop and coffee shop. Basically, Kelpies are scary mythical horsey type creatures with immense power and these bad boys represent the history of heavy industry in Scotland’s past. The legend states that a Kelpie would often throw his master off into water and then drag him under… sweet, huh? 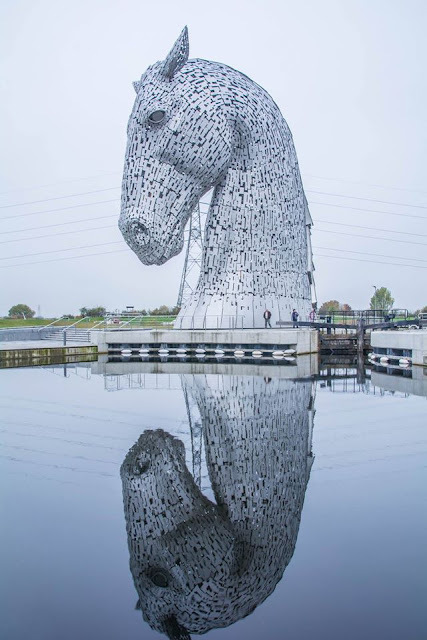 With this lovely image in mind, Scottish sculptor Andy Scott was commissioned to design a feature for Helix Park and he chose two ENORMOUS Kelpies. Mafia members must be terrified when they go to Falkirk. Imagine waking up to a 30 metre high horses head in your bed in the morning. The Kelpies now sit at the end of the Helix Park and overlook the M9 motorway that runs past the site. If you're on the road, you can spot them from a distance and, if you haven’t seen them before, they’re bloody terrifying and absolutely stunning at the same time. Even if you’re like me and used to drive past them a million times a day, they never fail to make an impact. They really are remarkable. They’re even more stunning in the dark, when they’re both lit up and cast eery shadows across the park. You can buy tickets to go inside one of the structures and have a peek around the interior. However, as you can get right next to them without a ticket (Helix is a public park, so entrance is free), it’s not necessary. There is still a little work going on within the Park but I defy you not to be impressed. It’s a photographer’s dream. Have you ever seen one of those photos from The Leaning Tower of Pisa where people position themselves to look like they’re holding it up? 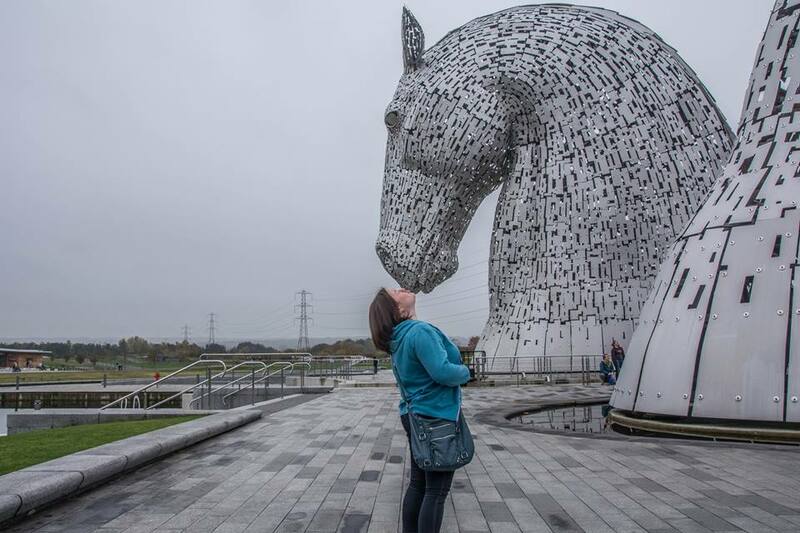 Well, we now have a spate of tourist photos with people standing under a horse’s head looking like they’re being eaten or, as my sister demonstrates expertly above, giving head down Kelpie a big kiss.